The first assault rifle cartridge was the 7.92x33mm Kurz. Contrary to ‘mainstream’ media hysteria, the assault rifle typically fires what are called intermediate cartridges. The old saw about the “jack of all trades and master of none” comes to mind when describing the terminal performance capability of the common intermediate cartridges. They are not powerful enough for humane medium game hunting at extended ranges but are more than effective for self-defense at less than 300 meters. An obvious exception to this is the 7.62x51mm, which is available in military pattern rifles, but this is a rifle cartridge and not an intermediate rifle cartridge. Originating in World War II Germany, the 7.92x33mm cartridge was designed to bridge the gap in terminal performance between the 8mm Mauser rifle and the 9mm Luger submachinegun. It succeeded in this role as the cartridge is only slightly less powerful than the 7.62x39mm cartridge as used in the AK47 rifle. I’ve had the good fortune to shoot an StG 44 and the recoil is slight and the weapon is very pleasant to shoot. It is also somewhat on the heavy side for such a gun but like all things Teutonic, it is overengineered on the side of durability. The recoil literally feels like a ‘roll’ followed by a slight push … not noticeable at all. ), you can see it in operation in Northeastern Pennsylvania. I only got a chance to shoot it on semi-automatic because of the range rules but the slight recoil indicates that full-auto controllability shouldn’t be too much of an issue. A three-shot burst should be devastating within 25 yards. Ammunition supply for this firearm is very limited. The only producer of ammunition currently making ammunition is Prvi Partizan with a 124gr FMJ. It is conceivable that a lightweight expanding bullet could be located and then handloaded into a 7.92x33mm case. The cartridge has fair to good terminal performance based on the single gelatin shot I have from the StG 44. The StG is a great firearm to shoot and is a firearm design of historical importance. 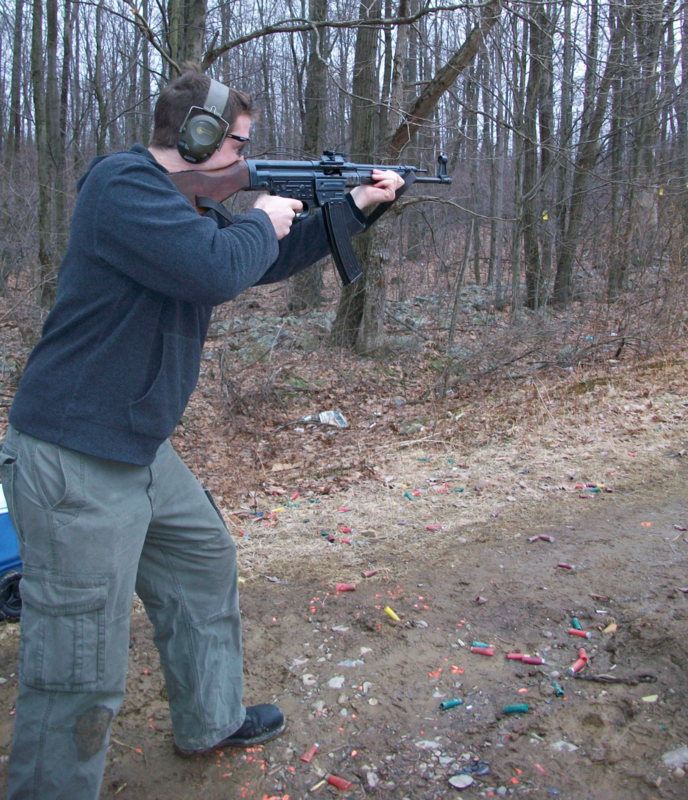 With a price tag of $15,000 for a transferrable full-auto StG 44, it is not practical as a defensive firearm. For the price of 15 AR-15 rifles it would be difficult to drag this gun through the mud and the rain today.